XLPAT introduces the advanced 'Evidence of Use' (EoU) module which helps finding products infringing your 'patented technology'. The system extracts novel 'Key Elements' from the 'selected claim' by using 'advanced 'Natural Language Processing' (NLP) and 'Machine Learning' algorithms and automates the process of retrieving 'first pass relevant products and their related companies'. Automation by the system at the backend saves upto 10 to 15 hours of time and efforts. Our manual search team is dealing with infringement matters since 10 years and we utilized that experience to analyze the critical aspects of 'Infingement Search' methodology to customize our algorithms accordingly. 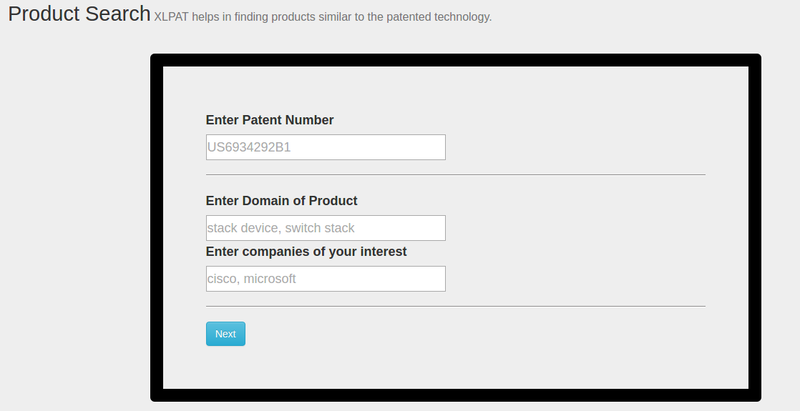 Your potential infringing product is just 3-steps away! Select the relevant claims and click on Search. When you click on the search button, the EoU module conducts an intelligent search at the backend. Furthur, you will see the links to the related products and their corresponding 'Relevancy Score'. Search relevant products with EoU module.